Free shipping with $40 purchase from RusticSweethearts. See item details below for sale terms. 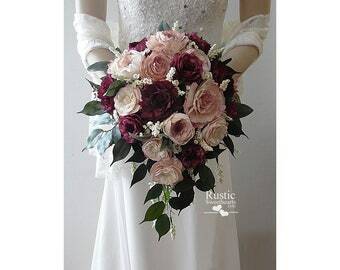 Made with our NEW luxe cottage and damask style sola roses! Colors are cameo, light dusty rose, navy and natural ivory. This collection goes beautifully with David's Bridal Cameo, Rose Gold Metallic Lace, Marine & Midnight, see last pictures in listing. Colors can be add at no additional cost. If you would like to customize this bouquet with additional colors feel free to message me. All materials used are artificial, dried and preserved, so its fine to purchase ahead of time. They will keep and look the same for years, making great keepsake flowers. Cascade Bridal Bouquet: 11" x 18"
Sola flowers, dried flowers and artificial greenery. The handle can be wrapped anyway you like. Select your style from the drop down menu. Processing time varies, please see the top or to the right of this listing for current delivery time. We ship priority mail and delivery takes 2 to 3 business days following the ship date. Cascade bouquets will be shipped with a stand made to secure it during shipment. FREE Priority Mail Shipping with $40.00 purchase! Now booking for September and later weddings. Please feel free to contact us for an estimated delivery date. Absolutely beautiful and met my standards in every way! Expected it to be heavier but it is super lightweight. Can't wait to carry this on our wedding day! 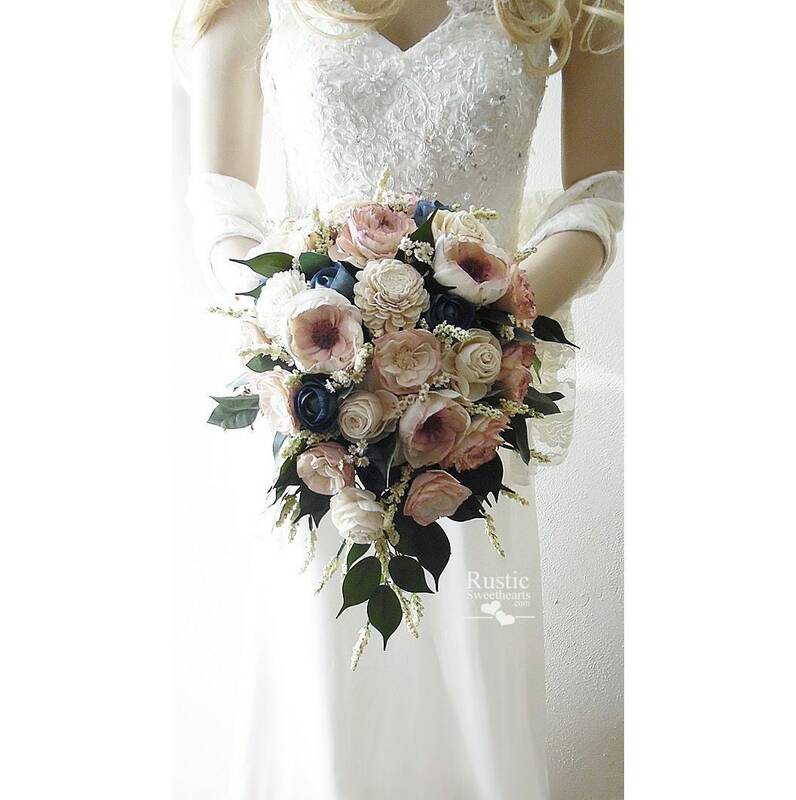 This flower crown is absolutely beautiful and matches the bouquet I ordered perfectly. 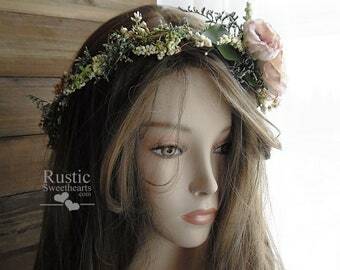 My only complaint is that is it quite itchy and uncomfortable on my head.. Maybe I should have went a different route than wood flowers for my crown..but I will have to figure something out to make it more comfortable to be able to wear all day for my wedding. It is gorgeous though. Custom order for Jessica ~ 23" Full Circle Crown, No Tie. Cottage Rose Flowers. Please notify us within 3 days of receiving your purchase if you are unhappy with your order and we will make arrangements with you for a refund. Shipping is FREE when you spend $40 or more! Your order will be delivered priority mail following the lead time. Delivery takes 2 to 3 business days following the ship date. Your invoice will be updated with a tracking number the day your order ships and Etsy will send you a copy of the tracking number. Please Note: Our flowers are intended for special events and photo props. Please use with care and supervision for newborns and toddlers. Some of our products contain small parts that can pose as a choking hazard. Please do not leave young children unattended while wearing or using any of our accessories. Buyer assumes all responsibility.